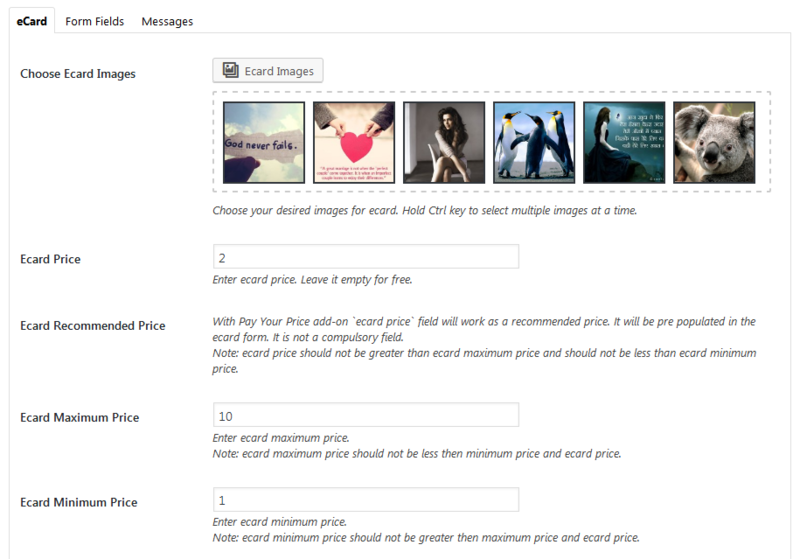 The Pay Your Price plugin lets you be flexible in what price you are willing to accept for selected ecard. You can use this plugin like to accept donations or to take a new approach to send eCard. You can suggest a price to your customers and optionally enforce a minimum acceptable price, or leave it entirely in the hands of the customer. Here you will find the main features which are included in plugin. Used for evaluating eCard price. Control using Minimum price, Recommended price and Maximum price. Full control over all things like field labels, error messages and etc. 100% multilanguage - WP ieCard - Pay Your Price is completely translatable both in front and back-end. The installation of the plugin is just like any other plugin installation for WordPress. Login to your WordPress site and go to Plugins > Add New. Choose the downloaded plugin zip file and upload this zipped file. Please unzip the file first to get the plugin zip file. Wait until WordPress has uploaded the file. If it's done click on Activate Plugin. Now you plugin is activated and you can see a message 'Plugin activated' at the top of the window. Plugin settings page holds various settings. These are the global plugin settings. Some settings can be overwritten from the ecard settings. Check this box to enable 'Pay Your Price' functionality. Once you enable this then relevant fields will be displayed at eCard post settings. These are the ecard post meta box settings. Control ecard price, recommended price, maximum price, minimum price and etc. With Pay Your Price add-on `ecard price` field will work as a recommended price. It will be pre populated in the ecard form. It is not a compulsory field. Note: ecard price should not be greater than ecard maximum price and should not be less than ecard minimum price. This is the ecard form `Price` field. You can Enable / Disable, Provide labels, Provide placeholder and etc. Control ecard price field validation messages and etc. The WP ieCard - Pay Your Price is made with WordPress standard and it is developer friendly. The plugin contains some markup files within the /templates/ directory. If you want to customize any markup related to front end, You just need to copy these files to your theme directory. Note: Do not customize these files directly within the core plugin itself as they are overwritten during the upgrade process and your customizations will be lost.